I decided to buy and review the Fitbit Charge HR because I see tons of people wearing it. At the gym, walking around downtown, in the grocery store – from my 60 year old neighbor to my friend’s 9 year old daughter. So I thought, it must be good, right? Everywhere I go I see them sold too; they’re at Macys, Kohls, and all over the mall so they must be doing something right. Well my main goal with the Fitbit was to see how well it would track my sleep and my steps. Here is my full review of the Fitbit Charge HR. I have to say, when I saw this wearable on other people’s wrists, I thought it was heavy like a watch. It looks pretty solid from a distance so I wasn’t sure how comfortable that would be when wearing it to bed. However, when I first took it out of the box I was surprised at how light it was. It’s simply a lightweight plastic with the actual device only consisting of the top part that sits on your wrist. The adjustable band was pretty good – it seemed to fit nicely. Wearing it all day in the heat wasn’t too comfortable since I would start to sweat underneath the rubber band. Once I got dry, it was back to normal. Wearing the Fitbit to bed for sleep tracking wasn’t too bad either. I never know what to expect when wearing a sleep tracker to bed since it’s not a natural thing anyway. I’d prefer to wear nothing at all to tell the truth. But since the Fitbit is lightweight it didn’t interfere too much with my normal sleep habits. After doing some research on the Fitbit Charge HR, I found that the heart rate sensor stays on all the time. 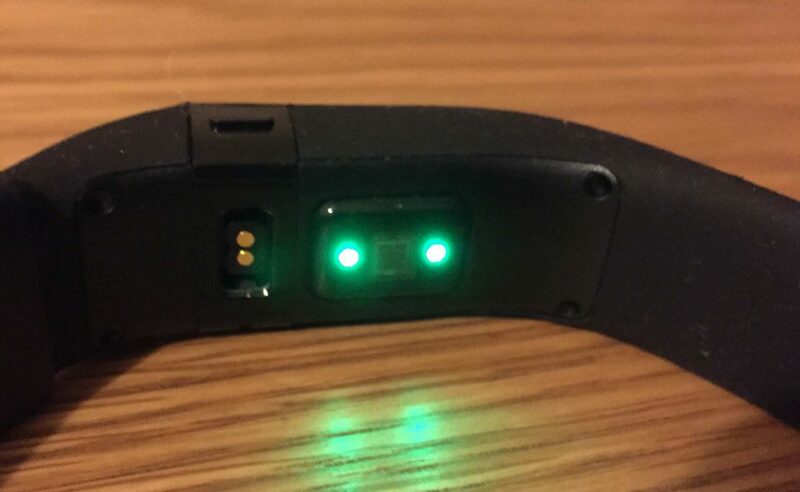 There is a pulsing green light underneath the device (the part that sits on top of your wrist) that measures something in your skin to determine what your heart rate is. The battery for me lasted about 3-4 days. Not as much as I had hoped for! So if you travel a lot and don’t want to carry extra chargers then this might not be the ideal fitness tracker for you. The Fitbit automatically turns on sleep mode when you go to bed. Most nights it didn’t log the exact time I laid down to go to sleep. 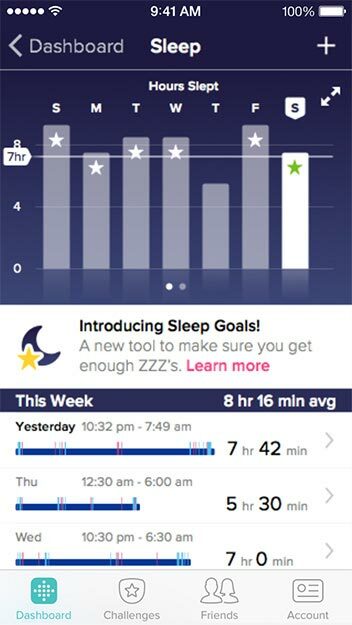 The Fitbit App tracks your time asleep, restless and awake. For me, it worked pretty well as I was able to verify when I was awake. I couldn’t verify when I was restless because I was still asleep. Some nights the green light was annoying because I could see the light shining in my bed when it was a little loose on my wrist. Overall, I wished it had a bit more detail about my deep sleep, light sleep, etc. If you’re trying to get a decent picture of how you slept, then the Fitbit Charge HR does a good job – not great, but good. Tip: if you’re looking to great more detailed sleep data like I was, then check out the Jawbone UP3. Setting up the Fitbit app was painless for the most part. It takes about 5 minutes to sync the Charge HR with bluetooth, after it took me about 5 minutes to set up an account from within the app. 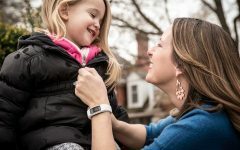 Fitbit really focuses on steps taken and exercise tracking. I did love the feature that lets you challenge your friends on a weekly basis. The challenge I used was how many steps per week you could take. Hitting 10,000 steps a day is no joke! If you enjoy being competitive and want to use it as a way to stay motivated then you’ll love this part of the app. The nice thing about the Fitbit is that since so many other people already have it, it’s not too hard to find other friends to invite to the challenge. This is where the Fitbit Charge HR really excels. You can tap the top part of the band to instantly view how many steps you have taken in a day. The app logs them and can send you notifications on how you’re doing throughout the day. I loved being able to see where I stood all day with my friends so that I could plan out my day to get more steps. I won’t go too far into this feature because there really are a lots of great parts of the app that let you work on fitness and exercise – a fitness calendar, weight loss goals, hydration, and lots of other nice features. I found a good deal on the Fitbit Charge HR and scored it for $110. If you do some Googling you’ll probably find it for anywhere from $100 – $149. Pro tip: Don’t pay full retail for this AND keep your receipt. Too many people have told me they had to get a new one sent to them because it stopped working for some reason or another. Overall, the Fitbit Charge HR is a fun wearable that I loved to use for tracking my steps and activities, and did a decent job of tracking my sleep. I had a great time competing with friends for total steps. I wish it gave me more insight into how I slept, but if you’re just looking for basic sleep information and an otherwise terrific fitness tracker then this is a winner.